Trail tires and wheels that can take it! 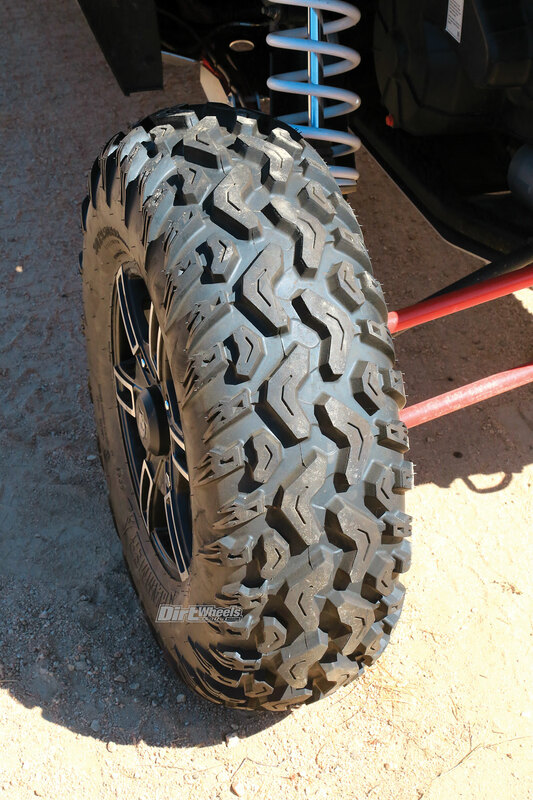 There is a perfectly good reason that most sport or sport utility UTVs come with a fairly aggressive tire with large, blocky knobs. UTVs are sold all over North America, and it hardly makes financial sense to equip machines headed for different parts of the country with different tires. Economy-of-scale pricing mandates that companies choose a tire that can do everything pretty well. Pro Armor knows that not everyone lives where the stock tires are most effective. 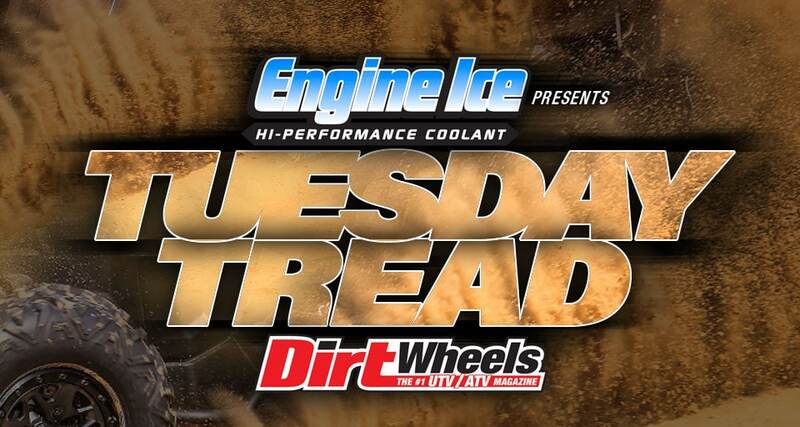 For instance, the Dirt Wheels crew drives on a lot of hard surfaces that challenge the widely spaced tread blocks of stock tires. For our area Pro Armor felt that its Hammer tires would work well. The Hammer uses 20mm tread blocks that are fairly close together and, perhaps more important, none of the center tread blocks run sideways. They are largely oriented along the length of the tire. That orientation puts a lot of rubber on the ground and makes for a very smooth ride at slow speeds. You don’t get any of that feel of the knobs walking on hard surfaces. Only the tread blocks along the side of the tire are molded on sideways. The Hammer has an eight-ply rating, and with the closely spaced knob blocks protecting the tire carcass, it should have pretty good flat resistance. The rubber itself has a high durometer rating suitable for use with high temperatures and rough surfaces. We hit one of our usual areas with abrasive, packed dirt with sections of loose rock and other areas of buried, planted rocks. Some are rounded like cobbles and others are more like small ledges. Traction was excellent. We did get some wheelspin when the turbo spooled up, but the spin was predictable and happened smoothly. Straight-line and turning traction was great. We could really stand on the throttle and feel like we had control. The price is $209.99 a tire for 30×9.5-15 tires for eight-ply tires that weigh a reasonable 36 pounds each. That is not bad for an eight-ply. The load rating is 1320 pounds per tire, so they are easily up to the task of a four-seater. The price is in line, but at 15 inches, these tires will not fit on the stock wheels. Pro Armor’s Wyde wheels work well, even though they have no real offset. The Hammer requires a 15-inch wheel. 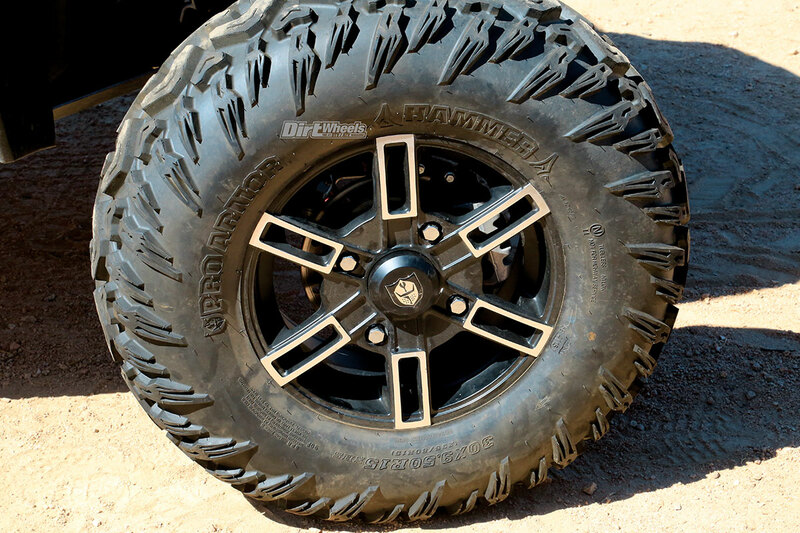 Our Hammer tires came mounted on Pro Armor Wyde aluminum wheels. The Wyde wheels come in either black or black with machined accents. We have the Wyde Accent wheels. Stock Polaris wheels have very little offset, meaning that the tires extend more to the inside of the hub than to the outside. The Wyde wheels have the outside bead of the tire almost directly over the lug nuts! They make the track narrower, and they are usually seen on East Coast cars for added clearance through the trees. We were worried that they might make our RZR XP Turbo 4 feel funny, but they did not. Perhaps having the shorter sidewall with the 30-inch tires on 15-inch rims (we tested against 30-inch tires on 14-inch rims) made the difference. The Hammer tires are great for the driving we do. They aren’t made for mud or sand so much, but they work great when we tackled washes. We never had any flats, and traction was always excellent. The Wyde wheels worked great as well, and while they didn’t feel like they narrowed the Turbo up, we would probably go with the Pro Armor Ryder wheels instead. It has more offset, is less expensive and comes in a 15-inch like the Wyde. If we were driving a lot in the trees, then the Wyde wheels would be a good choice. Go to www.proarmor.com to check out all of Pro Armor’s lineup, including wheels and tires.